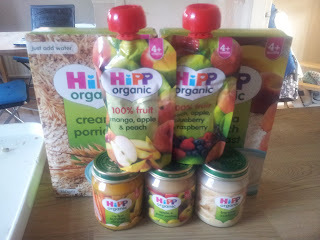 Coinciding with weaning week I was approached by HiPP Organic to review and give away some products. 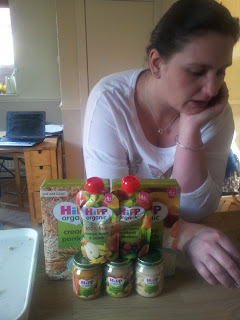 Like many mums I joined a lot of the baby clubs when pregnant, and the HiPP Baby Club was one of my favourites. They even have a little section on weaning premature babies. I feel the same way about commercially produced baby food as I do about disposable nappies. They most definitely have their place, but I wouldn't use it every day. I would use jars or pouches when out and about, and for travelling. I also found they were useful for husband duty! Packaged foods are also useful if you want to offer something to your baby you wouldn't be inclined to make yourself. Also some premature babies are incredibly fussy about texture, and commercial foods can be really good for them, as they are consistent, without funny lumps and bumps for the first weaning stage. I do think organic food is preferable for babies, when its seasonal and affordable, and commercially produced foods are a good way of providing that. I think for most families eating organic fruit and vegetables all the time is a big ask, I know our budget doesn't always stretch to it. I haven't reviewed them as such, because Joseph is a bit beyond them now however we did use the pouches for travelling recently, they are great for trips on the plane, and are ok through customs in Australia, who are notoriously fussy about food. I do love the traditional glass jars, but at times the pouches are handy as they are so light and take up little room. I have chosen to give them away to my new premmie mum friend Sammantha who has a little boy born at a similar gestation to Joseph for the same reason, who is about to start on her weaning journey with him. Healthy and nutritious food is very necessary for babies. mother should take care of what babies can eat and which kind of foods baby want. I like your idea .